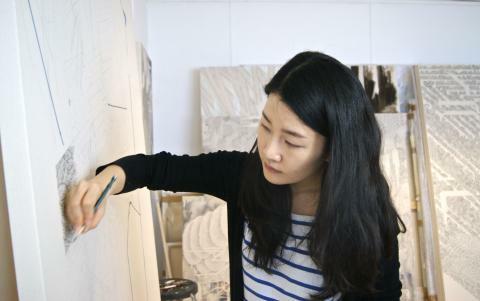 In 2006 Yun-Kyung Jeong graduated from Ewha Womans University in South Korea, and by 2008 she was enrolled at the Slade. 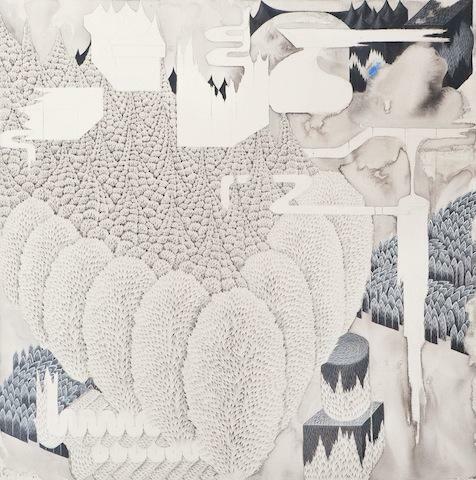 This transition between geographical territories was also a transition between artistic techniques and concepts, mirrored by her dynamic yet dreamlike canvases that flux between abstraction and detail. We meet at Yun's studio, several floors up an ex-faculty building. Although the 1960's shell is now home to one hundred or so artist studios, I see nor hear many others; the building is quiet with most behind closed doors. Her studio space is both calm and measured, her huge canvases, some almost as tall as the room is high, are stacked up against three of the walls. Windows stretch the length of the other, which is veiled over with white fabric that provides a soft light-box glow to the room. A large table sits squarely in front of it, scattered with books, a laptop and an improvised palette that is thick with a gradient of acrylic samples. Under her neatly folded hands, the same milky tones of paint speckle the lower half of Yun's red apron. The neatly stacked un-primed ivory canvases and silk paintings stretched over frames resonate with the small leaf-like emblem that Yun has made synonymous with her work. These repeated shapes, which she once quoted to represent her 'every breath', form topiarian shapes, waterfalls of foliage or simply exist as architectural planes. Standing in front of the above 'Constructing Jungle VI' feels as though I am caught in a frenzy of birds taking flight, the kinetic energy abated only by the muted and restrained colours. Yun remembers her love for art as far back as five years old. "I loved to draw, pencil drawings mostly" she begins, "when I was young the pencil was the essence, the accessibility." 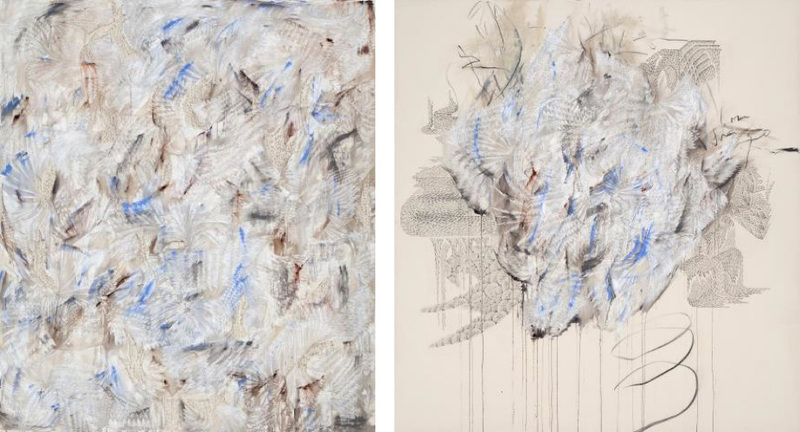 The comfort found in using a pencil is still appreciated by Yun, as pencil lines form the foundations of her works, which she later traces over in acrylic paint. This comfort however, proved to be somewhat challenging to one or two of her tutors in both Seoul and London: "My Professor in Korea wanted me to use more traditional methods of Eastern painting, like ink" she muses, "another at the Slade used to say 'Stop drawing! Go out and do something else!' he was very direct, but funny, so I didn't mind." "My parents were very supportive of me, my father grew up in the countryside and loved pictures" she says, "but being a young artist isn't too respected in South Korea. Although the art market is growing, it is still focused on great and established artists, not the younger ones. When I tell my parents that I am having a show in London, they ask me how much money I need, because many young artists in South Korea have exhibitions by hiring the gallery space themselves, which is expensive. Of course, here in London it is different" Yun smiles. "In London, people want to talk to you because you are an artist!" I smile back, both of us in silent recognition. "I wanted to learn about both Eastern and Western art, Eastern in particular because of the calligraphy and the spiritual lines. I learned about abstract art and lines from Korean paintings but in that sense I could expand this more freely in London" she says. Whilst an international education may not be unique, it is interesting, particularly because Yun-Kyung Jeong's desire to explore the holistic extends far beyond art education itself, a personal characteristic of hers that becomes more and more apparent as our conversation continues. Upon examining her work more closely, alternative perspectives are quite literally exposed via the artistic method and subject matter incorporated on her canvases. The structured sits in harmony with the unstructured, flora alongside architecture, meditated repetition apace with colourful emotion as well as distance and depth. "I contemplate the areas of detail first" Yun outlines, "these areas can take me one or two days to complete. I find this process calming, I enjoy it, it is part of my healing process" she says "I then add the colour and the freer shapes, this is what I find exciting, but it is difficult to know when to stop". And they are exciting, as these coloured areas appear to morph her pieces from geometric-like blueprints into windows onto another world, an abstract freedom seeping through the gaps in Yun's leafy architecture. In several pieces small fields of blue-grey and iron red are allowed to drip the length of the surface, an approach I crudely assume she has observed in the work of Cy Twombly, an artist Yun much admires: "I admire the way he uses lines of pencil alongside paint in his works, the way he uses his nearest tools to the same great effect" she tells me. Turner is another artist Yun has drawn great inspiration from. His watercolour depiction of the ruined Tintern Abbey (1794) covered in ivy, in particular, can be attributed to many of Yun-Kyung Jeong's Gothic shapes. "My paintings always have four or five elements in them, one being strong historical shapes" Yun tells me "Gothic architecture is nature replicated by humans, in a human form." "Do you see the human and the natural and separate, or equal?" I continue, thinking that some of the fan vaults have either been overtaken by leaves, or consigned to nature's entropy: "I see them as symbiotic" she answers "they are dualities, not contrasts. In historical paintings, like in Christian art, humans and nature look very divided, but that is not how I understand it to be." "I grew up in a metropolitan environment", she smiles "so where some people feel that a waterfall is nature, buildings are nature for me" which surprises me, considering how prolific the natural symbols in her work appear to be. 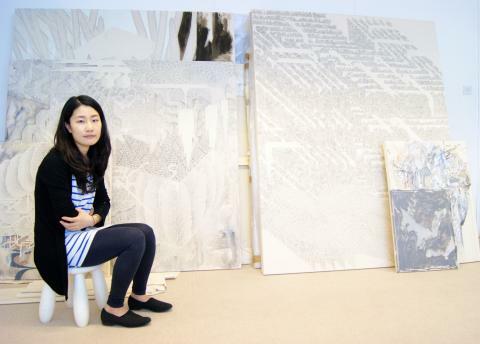 Like many artists, Yun-Kyung Jeong would love a larger studio in order to push the physical boundaries of her work to a greater degree. Vishal, her gallerist also hints at the use of neon as Yun becomes more and more confident with abstraction and colour. The enchantment of Yun's work however, is the soft and earthy colours, that don't necessarily draw you directly to a place or present you with too much information, but are dreamlike, and induce a state of mind where ones imagination is let loose. The balance of tone and form is calming, and allows you the viewer to choose where the location might be, and how it might feel. And that is a true Utopia. "I'm not trying to make something for anybody else, it is just for me."